We woke up to a cold and dreary Saturday morning in Göreme. Temperatures started out in the upper 30s F, so we dressed in several layers of warm clothing. After showering and getting ready, we enjoyed an open buffet of many Turkish breakfast items in the Kelebek Hotel. I partook in the traditional breakfast and ate black and green olives, hard boiled eggs, tomatoes, cucumbers, three kinds of Turkish cheese, bread and a mandarin orange. Fully nourished, Jason and I headed outside to join a group for the “Explore and Hike Tour” we had arranged through Heritage Travel, which is also owned by the Kelebek Hotel. After an initial bus mixup, we met the group at Göreme Panoramic View Point, just southeast of the village. We quickly took a few photos of the landscape and then returned to the bus. We had about an hour drive ahead of us to reach our first hiking destination in the Ihlara Valley. Our friendly tour guide told us about the history of Cappadocia and gave us a geography lesson on Turkey along the way. He told us the current spelling of Cappadocia translates to “land of beautiful horses.” However, the earliest record of the area, dating from the late 6th century BC, states the old Persian name was Katpatuka. I enjoyed just being able to look outside and enjoy the passing scenery. It was harvest time in Cappadocia. The farmers were out in full force harvesting their potatoes and pumpkins. We passed several tractors and horse-drawn wagons on the road; I almost felt like I was back in Nebraska. At approximately 11 a.m., our group of 14 started the highlight of our day, a 7 km (approx. 4 miles) hike in the spectacular Ihlara Valley, which boasts the deepest gorge in Asia Minor. Our hike would take us along the Melendiz River, which has carved an impressive canyon through the valley over time. This valley was once home to monks who instructed Christianity in cave churches – similar to the dwellings we had seen the previous day in the Göreme Open Air Museum. We climbed down several flights of stairs and then we had to maneuver down several large boulders to get down to the lush valley’s floor. The distance from the top to the floor is about 150 meters or 500 feet. Several women in our group were not wearing appropriate hiking shoes (ie: high heels) and slowed us down several times. Seriously? During our two-hour hike following the river, we passed many ancient cave dwellings, Russian olive trees, green moss, poplar trees in their full autumnal splendor, wild raspberry bushes, and several Byzantine rock chapels decorated with frescoes. The river paints the valley beautiful shades of red, green and brown in autumn. It was a peaceful trek filled with moments of conversation among the group here and there. Another interesting thing we saw was the ancient pigeon houses. The cave dwellers carved these houses into the rocks. Our guide told us the pigeons served three functions: as a messenger for communication, the droppings were used as fertilizer for crops and the egg shells were crushed and mixed to make the plaster for the cave walls. About the halfway point, we stopped to check out the small Agacalti Kilisesi (The Church under the Tree). Although there are several churches in the valley, this one has the best preserved painted frescoes. We ended the hiking portion of the tour near the Belisirma village, where we had lunch in a quaint riverside restaurant. Obviously, this restaurant sees tour groups all the time. Our server brought out a large tray with several platters that we could choose from and took the group’s order. Jason and I both selected the et güveç (meat casserole) served with bulgur. This was the first time I actually ate traditional güveç, which was a hearty dish served in a clay baking dish. We also were served Turkish red lentil soup, a salad and fresh mandarin oranges for dessert. After lunch, we got back on the bus, drove a little ways and stopped at the biggest rock-cut monastery in Cappadocia called the Selime Monastery and Cathedral. The site dates back to the 13th century when monks carved out the large church, living quarters, a large kitchen and stables for animals. The monastery was my husband’s favorite site. Once again, the views were breathtaking! We were able to climb through the caves on our own for about 20 minutes. It was not always an easy climb, but it was worth it to see this fascinating piece of world history. Our next destination was the former Greek village of Güzelyurt, where Greeks lived until the 1923 population exchange between Turkey and Greece. Here, we stopped to visit one of the oldest churches in Cappadocia – Güzelyurt Analipsis Church – which had been converted into a mosque. The old pulpit was saved in this church in Güzelyurt. On the way back to Göreme, we made one final stop in Uçhisar to take pictures of Pigeon Valley, aptly named for the many pigeon houses or dovecotes carved into the cliffs. By this point, I was exhausted and had fallen asleep for a little while during the drive. An evil eye tree in Cappadocia. After our long tour, we rushed back to the hotel for our first hamam (Turkish bath) experience followed by an intense anti-stress massage. The bath was interesting and relaxing. You can read more about this Turkish tradition here. We relaxed back in our room with a cocktail and played a few rounds of pounce, a solitaire-like card game. For dinner, we decided to stay in and eat at the hotel. It was almost 9 p.m. and the place was empty. We assumed everyone had eaten at the hotel the previous night because of the rain and were out exploring the town instead. 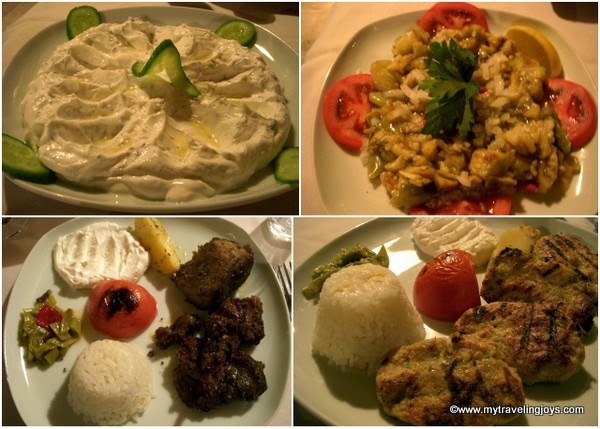 We ordered two Turkish mezes to start – çacık yogurt dip and eggplant salad. For entrees, we ordered tavuk köfte and roasted lamb shank. The food was simple, but delicious. With full bellies, we crashed in our room and fell asleep early since we had more hiking planned for Sunday in Cappadocia. Nighttime view of Göreme from our hotel in Cappadocia, Turkey. OMG I have been there, we even ate in the same place :) Cappadocia is awesome!